The FarmShare Fund supports a vibrant regional food system that is healthy for our communities, our farms and our environment. Our goal is to encourage initiatives that promote our region's farms and their products while improving food security for low-income families. Apply today to the 2019 FarmShare Fund Mini Grant Program. Project proposals are due by the end of the day, April 1, 2019. Read the press release announcing the 2019 program and request for proposals. Read more about the FarmShare Fund Mini Grant Program, the first round of grant recipients and their projects. 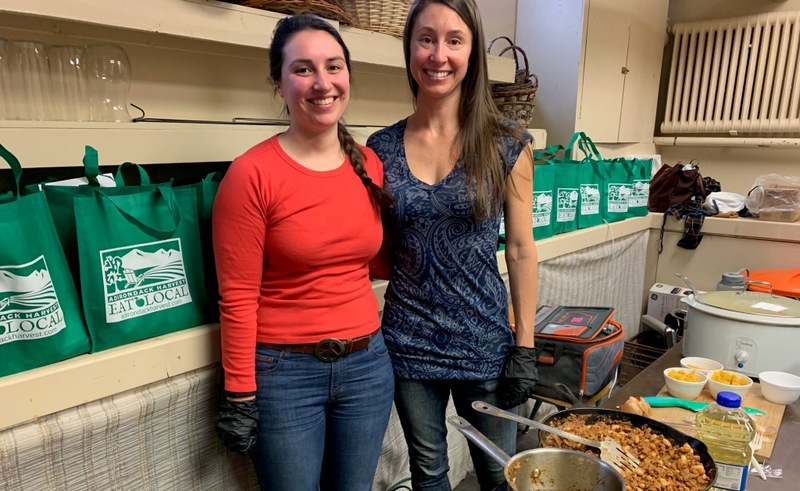 Photo: Meghan Brooks, Distribution Coordinator for The Hub on the Hill, and Carly Summers, Agricultural Resource Educator for CCE of Essex County — led a cooking demonstration at the Ecumenical Food Pantry in Lake Placid on Friday, February 22, 2019. Participants learned how to prepare beef, bean and tomato sauce served on winter squash polenta. The demo was developed by CCE and The Hub on the Hill and funded through ANCA’s FarmShare Fund mini grant program.